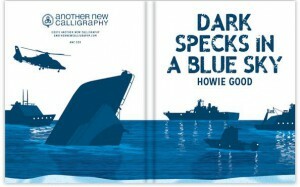 Hey guys, just a head’s up, if you love Howie Good as much as we do, you’ll want to pick up a copy of his new book, Dark Specks in a Blue Sky, available for preorder now. If you haven’t had the pleasure of reading Howie yet, check out his work in Unbroken. He’s in our current issue, as well as our past issues. Can you tell we love his writing? Go preorder a copy of Howie’s new book; we promise you won’t be disappointed.